I wrote for Mongabay about the threats facing the Monarch Butterfly Biosphere Reserve in Michoacán and the State of Mexico. The story is available in both English and Spanish. 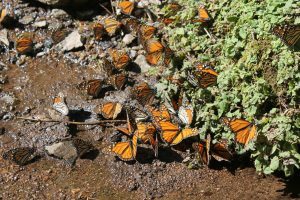 “ZITÁCUARO, Mexico – ‘As long as the butterflies keep coming, we’ll still have work here,’ says Javier Ambrocio, looking out over the Sierra Chincua Monarch Butterfly Sanctuary. A cold breeze blows across the steep hillside, over 8,000 feet above sea level. Ambrocio works as a tour guide in the Monarch Butterfly Biosphere Reserve, which straddles the mountains between Michoacán and the State of Mexico. The hibernation season, when millions of butterflies come to the reserve, began in mid-November and will continue until next March.